Eat Is Barry the Biscuit Boy The Greatest Food Ad Icon Since The Jolly Green Giant? Is Barry the Biscuit Boy The Greatest Food Ad Icon Since The Jolly Green Giant? Cravendale, the UK's top milk brand, has launched a TV campaign to remember. Barry the Biscuit Boy is our new favorite food advertising icon. Notice the character’s striped swim trunks, irresistible swagger, and relentless sense of adventure displayed in the Cravendale milk ad above. Cravendale, the UK’s top milk brand, has teamed up with advertising agency Wieden+Kennedy to launch a TV campaign that goes above and beyond their #CatsWithThumbs ads. 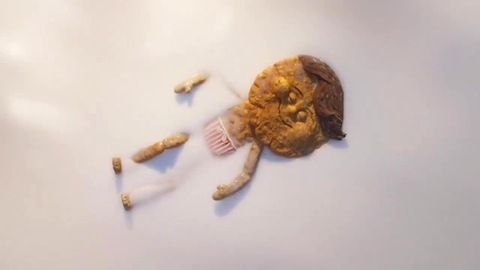 The new fable-esque ad is centered around Barry the Biscuit Boy, who comes close to crumbly death after splashing around in a lake of Cravendale milk, despite his mother’s warning not to swim for too long. Naturally, his soggy biscuit head crumbles apart, forcing Barry to wander blindly home, where his parents bake him a new head and hand him a glass of milk. The ad is a mix of puppetry, stop motion animation, and CG, and will be featured in digital, print, and on social media, as well as on redesigned product packaging. All we can say is, long live Barry the Biscuit Boy, the most lovable food character since the Pillsbury Doughboy.